It is our office’s duty to establish the identity of any passport applicant. To assist us in this process, please bring a certified copy of your birth certificate with parent’s names and an ID (Driver’s License preferred). One 2×2 inch color photo with a white background meeting U.S. Dept. of State requirements will also be needed to send in with your application. 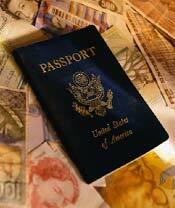 We are able to take your passport photo for a fee of $12.00. You may apply for a passport during regular office hours which are 8:30 a.m. – 4:30 p.m. Monday thru Friday. It is best to apply for your passport at least 4 to 6 weeks prior to travel. A $35.00 execution fee is required, payable to the Kankakee County Clerk’s office. An adult passport is valid for ten years; underage passports are valid for five years. Download a copy of the passport application form.